Dimensions 0.75 by 5.75 by 8.75 in. 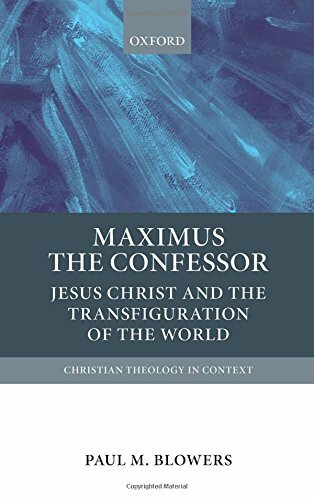 Amazon.com description: Product Description: This study contextualizes the achievement of a strategically crucial figure in Byzantium's turbulent seventh century, the monk and theologian Maximus the Confessor (580-662). Building on newer biographical research and a growing international body of scholarship, as well as on fresh examination of his diverse literary corpus, Paul Blowers develops a profile integrating the two principal initiatives of Maximus's career: first, his reinterpretation of the christocentric economy of creation and salvation as a framework for expounding the spiritual and ascetical life of monastic and non-monastic Christians; and second, his intensifying public involvement in the last phase of the ancient christological debates, the monothelete controversy, wherein Maximus helped lead an East-West coalition against Byzantine imperial attempts doctrinally to limit Jesus Christ to a single (divine) activity and will devoid of properly human volition. Blowers identifies what he terms Maximus's "cosmo-politeian" worldview, a contemplative and ascetical vision of the participation of all created beings in the novel politeia, or reordered existence, inaugurated by Christ's "new theandric energy". Maximus ultimately insinuated his teaching on the christoformity and cruciformity of the human vocation with his rigorous explication of the precise constitution of Christ's own composite person. In outlining this cosmo-politeian theory, Blowers additionally sets forth a "theo-dramatic" reading of Maximus, inspired by Hans Urs von Balthasar, which depicts the motion of creation and history according to the christocentric "plot" or interplay of divine and creaturely freedoms. Blowers also amplifies how Maximus's cumulative achievement challenged imperial ideology in the seventh century--the repercussions of which cost him his life-and how it generated multiple recontextualizations in the later history of theology. About: This study contextualizes the achievement of a strategically crucial figure in Byzantium's turbulent seventh century, the monk and theologian Maximus the Confessor (580-662).